How do you plan a move from on-premises to Office 365? Shire is a pharmaceuticals company that enables people with life-altering conditions to lead better lives. Shire focus on developing and delivering innovative medicines for patients with rare diseases and other specialty conditions. Shire is a global pharmaceutical company that has grown by acquisition to 22,000 employees. Shire had an operational objective of migrating from SharePoint on premises to Office 365, to begin getting value from their investment in the Office 365 platform. Shire IT had been managing their SharePoint estate but required support in understanding the 15 new Office 365 services now available to them – beyond SharePoint, Yammer, Skype and Outlook. This understanding would help Shire to roll-out the new Office 365 platform, while maximising their return on investment in Office 365. Shire also had number of business objectives that needed to be met. Shire needed to understand how the new Office 365 services such as Delve, Groups and Video Portal could create a digital workplace platform on Office 365 that would help to engage and inform employees about its strategy and plans for 2017, offer personalised communications and make it easier for teams to collaborate and share information across geographic borders and time zones. With Shire embarking on a period of exciting growth by M&A, the business was looking for a speedy understanding of what Office 365 had to offer and how to roll them out to the business to meet their business objectives. AddIn365 and the AddIn365 Office 365 roadmap methodology fitted the bill. AddIn365 worked with Shire to produce a SharePoint on premises to Office 365 roadmap in only seven business days. 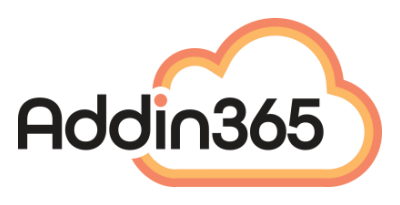 This was possible because of AddIn365’s deep knowledge and expertise of the Office 365 platform and its associated services. AddIn365 paired Office 365 training with the production of an Office 365 roadmap for Shire. This enabled Shire to understand how they can maximise the return on their investment in Office 365, by choosing the correct Office 365 service to meet their business needs, from day one.